Happy Tuesday! Happy Day indeed for me, it’s Mexican Mother’s Day and I love my Mama! 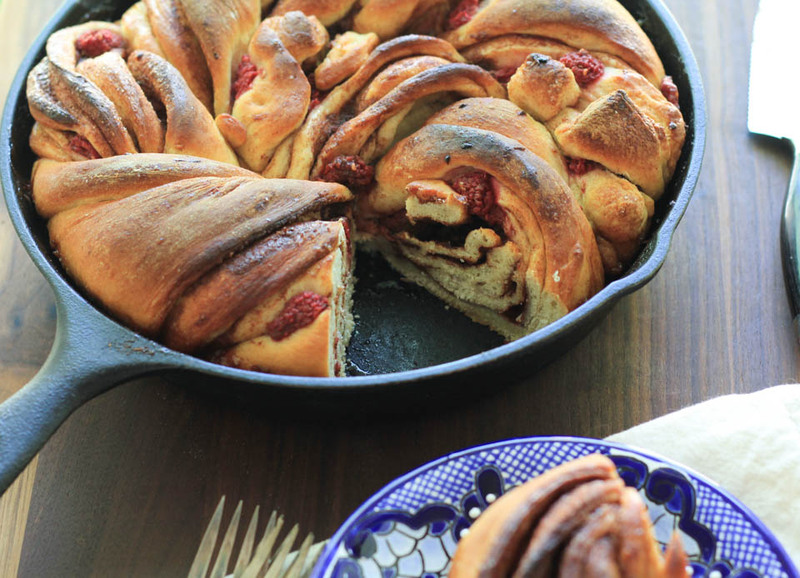 I made this Berry Cinnamon Skillet Bread in her honor, since she is still in Mexico visiting her family, probably enjoying a beautiful brunch at the local country club eating my favorite chilaquiles on the planet. It’s a tradition to go to the Campestre to get brunch when we visit, they have the most gorgeous brunch spread. But since my Mama isn’t here for Mother’s Day or Mexican Mother’s Day I made her something I know she’d love, and I’ll make it for her when she gets back later this month. Normally we celebrate both, but go out for Mexican Mother’s Day since there are usually less people than the US one. Brilliant right?!!! And great for her, she gets two Mother’s Days. She will love this and I am so excited to share it with her. I miss her, but I am so heart happy she is with her sister, cousins, nieces, and nephews enjoying her home country with all of the goodness Mexico has to offer. She is in excellent hands, being loved on this beautiful day. Even if I do miss her, I know she is loving every moment with her family. So for now I will call her and wish her a lovely day and to enjoy all of the tacos for the last couple of weeks she is there. She is a beautiful woman that I am forever grateful for having me. I am very blessed to have in her in my life, for having taught me how to be independent, strong when needed, and also learning from her “mistakes” is just as much a blessing. I love you Mama! She truly is a unique and incredible woman. You could also make the dough the day before, and store it in the fridge overnight to bake it in the morning. Which is great! The instructions show a step by step on how to get to that point. I’ll be on ABC’S KATU CH.2 AM Northwest Portland on Wednesday May 11th showing how to make this beauty! Tune in from 9-10am to check it out! I baked this in a super buttered 10inch cast iron skillet. 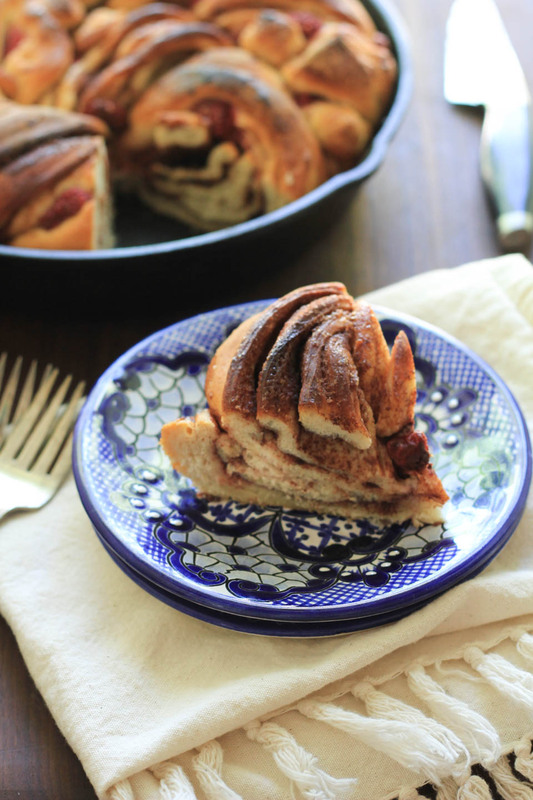 If you do not have a cast iron skillet, bake this in a cake pan or pyrex dish. It may just have a different shape but be equally as tasty! Combine yeast, 1 teaspoon sugar, and ¼ cup warmed water in glass measuring cup, use a fork to combine. Let sit until foamy, about 5 minutes. Add remaining sugar, buttermilk, butter, egg, cinnamon, and salt to a medium bowl, whisk to combine. Add yeast mixture to egg mixture, whisk to combine, add to bowl of a stand mixer fitted with paddle attachment along with flour. Turn mixer on medium, mix until dough is smooth and pulls away from the side of the bowl, about 6-8 minutes. Remove bowl from mixer, cover with plastic wrap or clean dish towel, set aside in a warm place. Let the dough rise for 1 hour, until it has doubled in size. Tip: turn oven on it’s lowest setting for 15 minutes, turn off, and place the mixer bowl with dough in it until it doubles in size. 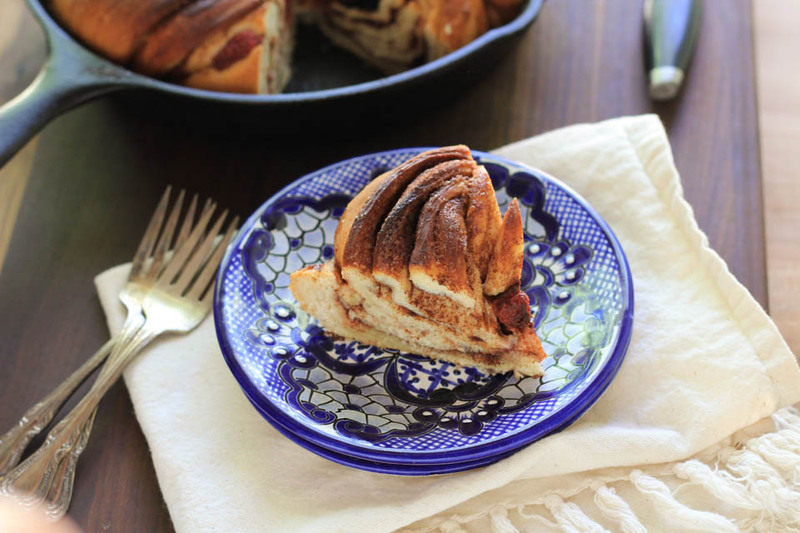 Make the filling: Combine sugar, cinnamon, and salt in a medium bowl. Mix to combine using a fork. Gently remove the dough from the bowl onto a lightly floured counter. 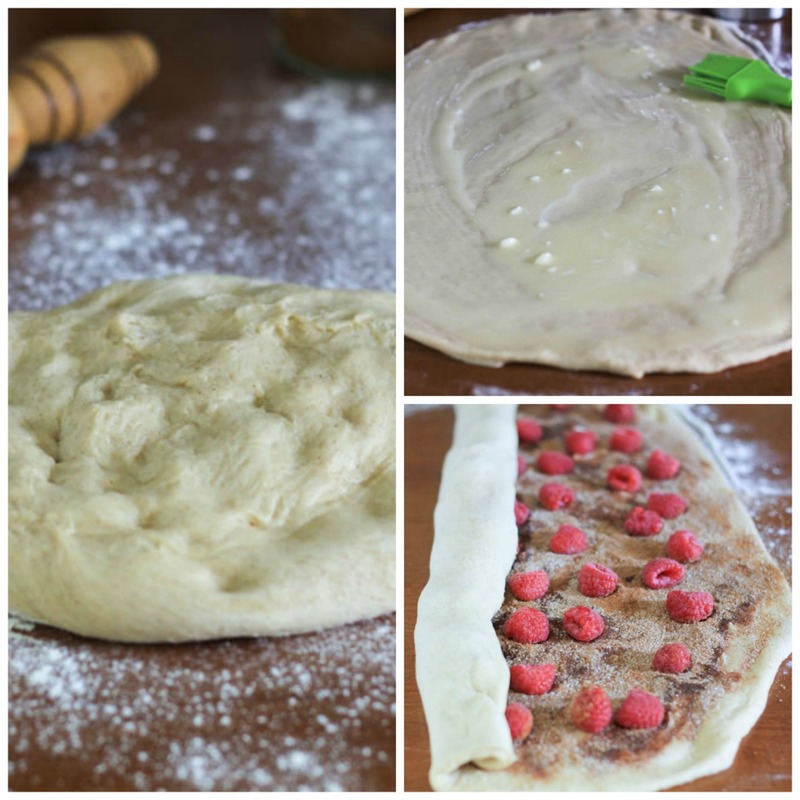 Using rolling pin, roll the dough into a 10 x 20 rectangle. Brush to melted butter on the dough. Sprinkle the sugar filling mixture evenly on butter. Lightly press sugar into dough using the rolling pin. 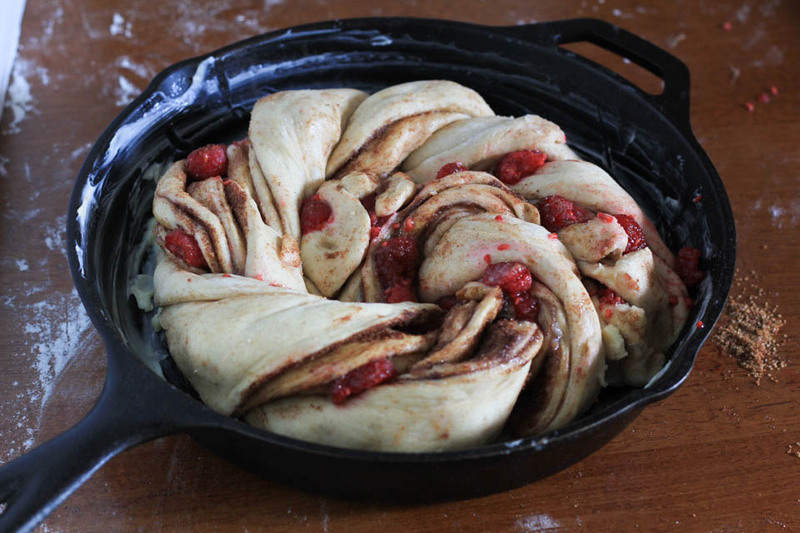 Add berries evenly over sugar, pressing down on them to ensure they don’t roll out when you braid the dough. 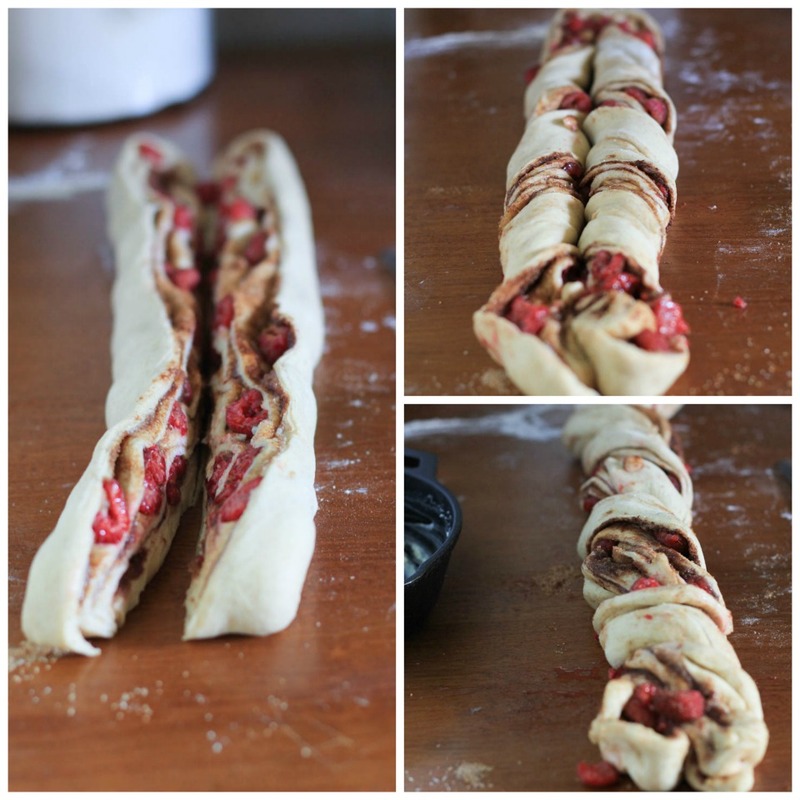 Roll dough up fairly tightly. Preheat oven to 400 degrees while the dough rises. Uncover the dough, (If refrigerated, let them sit at room temperature for 15 minutes) bake for about 25-30 minutes, or golden brown. Remove from oven and allow to cool 5 minutes before slicing and serving. Store covered on counter for 1 day, store in fridge on an airtight container for another 2 days. Other yummy baked goodies from NJB and my blogging friends!